Mami Needs A Mani! : February Mani Swap! Ok, first actual picture post here! Each month, a lot of the awesome BHB ladies on BabyCenter participate in a mani swap. If you're not sure what that means, read on! Each person is partnered up with another nail enthusiast from the group. 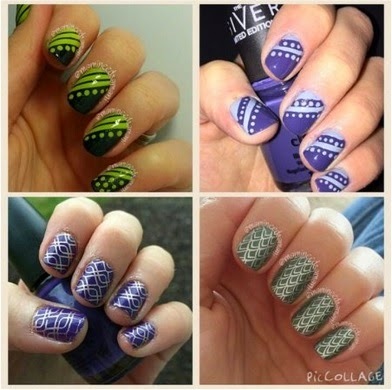 We scour each other's Instagram pages and choose a mani to recreate, without telling our partner what we're doing! It's loads of fun, and I think I've only missed a couple of them along the way. 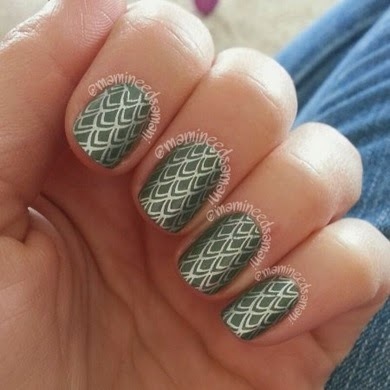 This month I wanted to try to accomplish double duty with my swap mani. See, the weekend I completed it, I was also going to a wild game dinner. 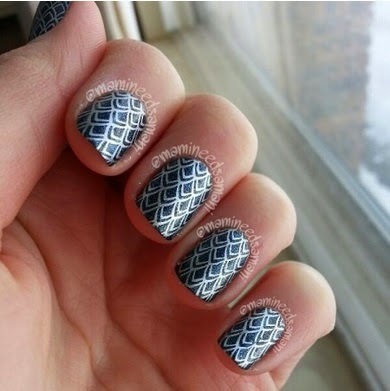 I found an absolutely gorgeous stamped mani - which I could use my Winstonia Hunter's Life plate for - and decided to run with it. Below is the finished product! Originals are on the left, recreations are on the right. This is my final solo shot for the swap. I used Sinful Colors Man Hunt (from the Sinful Shine line) as the base color, and stamped with Essie No Place Like Chrome and my Winstonia Hunter's Life plate. It was so fun!